What might become of our civilization after world-wide nuclear war? How might government and humanity react? What would the fallout be? The Heights of Perdition by C.S. Johnson gives us a possible glimpse. Aerie St. Cloud is a dutiful student, if not a tad willful, but is eager to prove to her family unit and her government that she can be a strong member of the State military. Growing up under the strict tutelage of the State in the underground capital New Hope, Aerie knows she can never ask the questions that tumble through her head. Instead, she must follow orders and become what everyone around her dictates. But when fate finds her inadvertently kidnapped by a notorious space pirate, Exton Shepherd, the opportunity to freely ask her multitude of questions and spread her wings is one she can't give up. Exton, meanwhile, must deal with the unexpected complications presented by the strange young woman and the way she affects his long-quiet heart. The world created by C.S. Johnson is, eerily, one I had no difficulty picturing should nuclear world war occur. Questions raised about government, religion, and human nature were peppered throughout the narrative, elevating The Heights of Perdition from a mere space fantasy to something much more thought-provoking. The inner turmoil experienced by both Aerie and Exton were very understandable, and I particularly enjoyed their verbal sparring episodes. 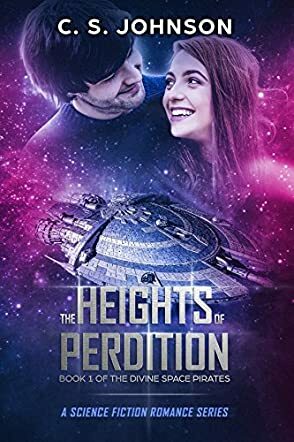 With themes of obedience, duty, revenge, forgiveness, love and redemption running throughout, The Heights of Perdition took me on a roller coaster ride and left me eager for the second book in the series. The Heights of Perdition is the first book in a Christian space opera series by C.S. Johnson. While the story takes a little while to get rolling, once it does the intricate world is a delight. The daughter of a prominent general within the URS dictatorship, Aerie St. Cloud, is crushed when her dreams of serving in the military are denied. When a rebel starship called the Perdition swoops down in a raid, Aerie is accidentally taken prisoner. Aboard the marvelous starship, Aerie stumbles onto one secret after another. Her growing admiration for these freedom-loving people and their way of life tests her loyalty to the URS, but her chemistry with Captain Exton Shepherd may not survive the truth about her identity. Right and wrong, and true and false can be very confusing in outer space. I found The Heights of Perdition a thoroughly enjoyable, creative read for younger readers. Echoes of popular franchises like Star Wars make this futuristic saga familiar, but the ideas and characters were entirely unique, and C.S. Johnson does a good job blending a number of elements into something new. There are thought-provoking images of a future world here, in which a hysterical dictatorship has risen from the ashes of a nuclear disaster, but teen girls will likely pick it up for the romance alone. Good, clean romance writing, with just enough spark but not too much, should draw girls while the intellectual and political discussions give a solid underpinning to the world and might interest their parents as well. Recommended. I found The Heights of Perdition by C.S. Johnson a quick, delightful read. It is a combination of the science fiction, romance, and Christian genres. I am a huge science fiction fan and I occasionally like a good romance, so I thought I would give it a try. I am not so much into Christian literature, but I have read C.S. Lewis and other lessor known names in the genre. The Heights of Perdition is rather light on the hard science fiction aspects, though the picture of a dystopian future is good. C.S. Johnson is also not heavy handed in pushing the “Christian” aspects of the novel. I found it focused more on the family and societal aspects of Christianity rather than on Christianity itself. The strongest genre element in The Heights of Perdition seemed to me to be romance. It is a good, classically romantic story that just happens to take place in the future. There are two elements that stand out in The Heights of Perdition. The first is the future world setting. This is carefully done and C.S. Johnson does a great job showing us the differences between the two warring societies. This is cleverly done through the characters of Exton Shepherd and Aeris St. Cloud. I really liked the back and forth banter between these two individuals, raised in very different societies, but who are, in actuality, so much alike. They are the heart of the novel. I enjoyed them and C.S. Johnson wrote them very well indeed.